Besides the two Target versions, which differ only through whether they have a barcode, there are another two versions of Atlantic’s Greatest Hits and Greatest Hits Vol 2. Remarkably both are actually rarer than the Target CDs but are worth less as Target collectors generally aren’t interested in them. They can easily be distinguished from the earlier CDs because of differences in the text on their back covers. 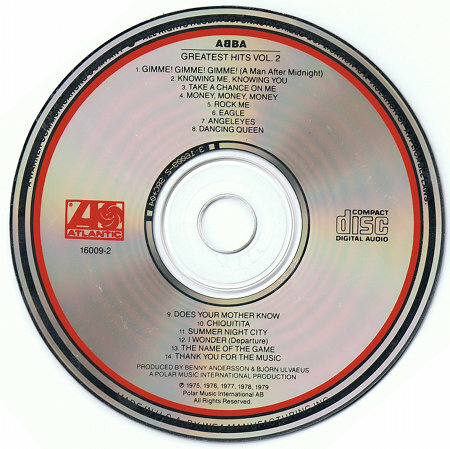 The third version of the two CDs was pressed by Atlantic in the US. It is believed to have first appeared in 1986 after Warners finally got access to US CD pressing facilities. This version doesn’t feature any coating on the disc face, which also features a much simplified design. Instead of the target, the pattern consists of two rings around the edge of the disc. These versions can easily be identified on sight because they clearly state “Printed in USA” on their back covers whereas earlier copies featured “Printed in West Germany”. Copies of the third version are quite rare as they were only pressed in very limited numbers but only generally fetch a maximum of $50 in online auctions. The fourth version, which was pressed up by Atlantic Canada in the late 1980s, is even rarer. Again, they feature a much simplified face designs and can be easily identified by several references to Canada on the back covers. It is unclear how much they would fetch in auctions as they rarely appear. One thing remains constant among all the versions, however: they all share the same mastering, which is much praised by some audiophiles. My own sense of the two CDs though is that neither are particularly special and Greatest Hits Vol 2 sounds inferior to its excellent European equivalent. The packaging is also relatively similar and while Greatest Hits is quite an attractive package, Greatest Hits Vol 2 is inferior to the European PolyGram in this respect too. My US-pressed Greatest Hits Vol. 2 contains the exact same mastering as both the Target Atlantic and the West German Polydor … except that they’ve inserted digital silence over the tape hiss between tracks. In so doing, they’ve truncated some of the fades by about a second. My Atlantic GH1 differs slightly from the one pictured above. It’s got a ring of text at the top (outside the black/red rings) with Warners copyright information. At the bottom, also outside the rings, it says MADE IN U.S.A. BY SANYO. 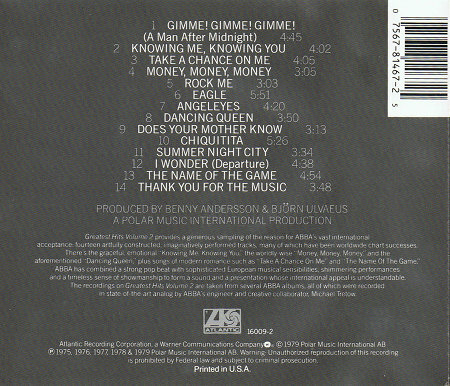 The back cover is identical to the USA version pictured above. I picked it up in a used section of a CD store for about $6.